When your computer gets hit by CryptoFinancial Ransomware you should start praying that it is one of the possible variants that we have tested because in that case your files may be saved from encryption. As you may know ransomware infections are one of the most dangerous malware threats that can attack a computer. Many cases end with victims losing their files, including documents, videos, music and image files, and archives as well. However, we have found that this otherwise vicious infection fails to encrypt your files. 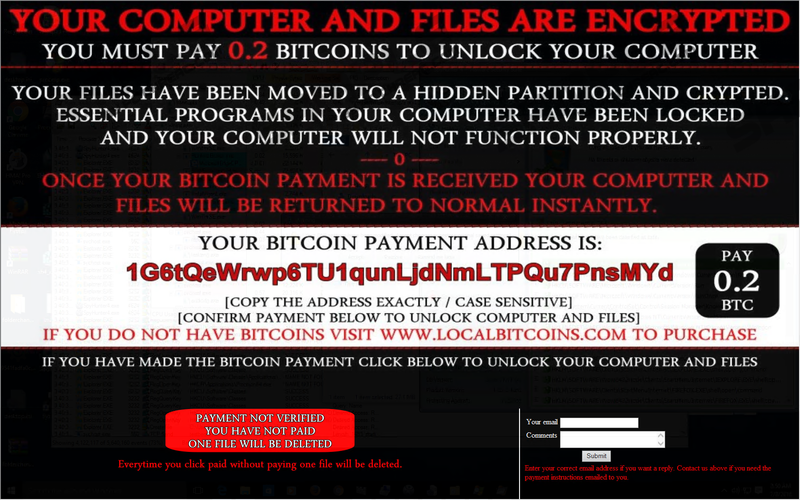 Instead of making all your major and personal files inaccessible, this ransomware seems to simply lock your screen with a full-screen ransom note image that replaces your normal desktop background. Although seemingly your system is locked and you cannot do anything but follow the demands to get your files and computer back, the good news is that you can actually get rid of this frightening note and move on to quickly remove CryptoFinancial Ransomware. These criminals demand you to pay a certain ransom fee in order for you to be able to restore your files. But in most cases criminals do not even deliver the decryption key or tool as promised, not to mention the possibility of a server shut-down, which makes it virtually impossible to send you the necessary key. Please read our full report on this ransomware to learn how you can avoid such a major hit in the future. A quite an efficient way to prevent this ransomware to infiltrate your operating system is to know how it is distributed on the web. Similarly to most of its peers, this infection also travels as a malicious attached file in spam e-mails. You may feel safe just because you know you have a spam filter, but you should know that sophisticated spam can get through it and land in your inbox. So next time you check your mails, keep in mind that just because you have an active filter, it does not mean 100% security against cyber criminals and their tricky mails. You are better off if you do not take mails in your inbox for granted because this is exactly how you can infect your system with dangerous threats such as ransomware. If you are lucky, it takes more than just one single click to drop the malicious executable onto your system and initiate the attack. In most cases, you are deceived to believe that the spam is indeed a very important message that you must see right away, including its attachment. Criminals often use topics like credit card charge error, undelivered FedEx parcel, error with an invoice, and more. If you get a mail with such subjects, it is quite likely that you will rush to open them without a second thought; even if you feel that this mail must be a mistake, you will be still interested or curious to see what it contains – first click. The second click takes place when you decide to download the attached file, which can be a photo (.jpg, .bmp) or a text file with macro (.docx, .pdf). If you are in the luck, this infection is still not activated at this point. But, unfortunately, most users do not stop here. You do not usually download an attachment from an important-looking e-mail just to store it; it is more likely that you will also want to open it right away. This is the third click that can indeed doom your system and your files; this is when you initiate CryptoFinancial Ransomware. Obviously, when you run the executable file, there is no stopping this beast anymore. But it does not mean that you can leave such an infection on board. We recommend that you delete CryptoFinancial Ransomware immediately after you realize its presence. Normally, right after activation, ransomware programs start encrypting your files with an AES or RSA algorithm and store the decryption key on a secret remote server before displaying the feared ransom note. However, our research shows that CryptoFinancial Ransomware does not seem to do so. It is possible that there are other versions that actually encrypt your files, but the ones we tested certainly did not. Soon after this infection starts up, it replaces your desktop wallpaper with its own image, which is indeed the ransom note claiming that it encrypted your computer and your files. This note seemingly locks your screen and could scare you to believe that your computer is really locked. These criminals demand a 0.2 BTC fee from you for your files and your computer to be unlocked. This is around 130 US dollars, which cannot be called a high fee but it is still a waste of your precious money if you consider that your files may not even be encrypted after all. You should also know that experience shows that cyber crooks do not usually keep their word and they do not decrypt files after getting the money transfers. If you want to unlock your computer, all you need to do is remove CryptoFinancial Ransomware right now. We are here to help you with the elimination of this annoying and potentially dangerous ransomware. The happy ending in this story is that it is not at all difficult to manually delete CryptoFinancial Ransomware. You can try to do it even if you are not an advanced computer user. Please follow our instructions below step by step to make sure that no leftovers remain on board. For best results and protection, we suggest that you employ reliable security software. It would also help a lot if you kept all your programs and drivers always updated. Tap Alt+Tab simultaneously and replace the active lock screen window with another one. Tap Win+E to start up the File Explorer. Delete the task file named “WVGtpmEUlXdWVGtpmEUlXdhuSpCpqZGMuTRLhuSpCpqZGMuTRL” in “%WINDIR%\System32\Tasks\Update” directory. Quick & tested solution for CryptoFinancial Ransomware removal.